How cool. Our images and sentiments are different, but the inspiration the same. Thanks Sue. I think I could open any of Murakami’s works at any page and find words to inspire. Lovely photo. Blue blue sky and fabulous building. Thanks Jude. 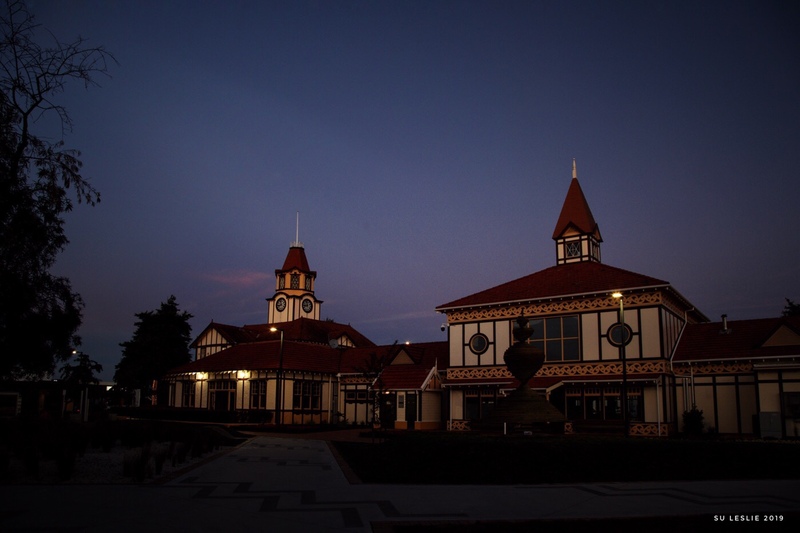 Rotorua has a few buildings in the same style — the Bathhouse, and a couple of churches spring to mind. I don’t know if they had the same architect, or if it was more a copycat thing. You caught the precise moment to illustrate the verse by HARUKI MURAKAMI. Great job, Su! Phenomenal! (does it count when it’s a digraph?). Perhaps playful is preferable? Looks like a lovely summer evening, Su. I wish I was there Su looks heavenly. So do I. It was taken on holiday a couple of weeks ago, and now it’s back to normal life. back to normal can be okay too…. It’s interesting isn’t it. There are several in the same style in Rotorua — unusual in a town so steeped in its Maori heritage. Thanks for dropping by and commenting.